Carolyn Breuer was born in Munich. She took piano lessons before she decided to change over to playing the (then classical!) saxophone. Soon her father acquanted her with the basics of Jazz. Playing „house music“ in the evenings became a beloved ritual at the Breuer home. At the age of 15 she was already playing in several bands. When she was 19 she was the first female musician to join Peter Herbholzheimer's Bundesjugendorchester (Youth Jazz Orchestra). 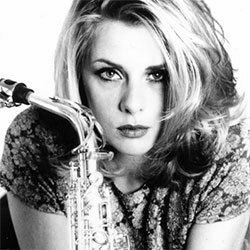 From 1988 to 1993 she studied Jazz saxophone at the Royal Conservatory Amsterdam in Hilversum, played month-long engagements in Athens on a regular basis with her own Carolyn Breuer Quartet and she played saxophone in a Drum tobacco commercial that was featured worldwide in all cinemas. At 21 years she recorded her first CD „A Family Affair“ together with her father Hermann Breuer, a famous Jazz musician on the piano and the trombone himself, for the renowned label ENJA. They played numerous festivals. After her state exam she recorded the CD „Simply Be“ with dutch singer Fay Claasen. The year after she recorded her own album „Aquaintance“. Then she moved to New York and took lessons from George Coleman. Branford Marsalis, who attended one of her concerts was very fond of her playing and invited her to take lessons from him. The first lesson she paid with a jersey of Amsterdam's soccer club Ajax. When left New York and came back to Amsterdam she was touring Spain, Belgium, Luxemburg, Turkey, Greece and Germany with her quartet. She even shared the stage with George Coleman at the North-Sea Jazz Festival. In 1999 the saxophone company VMI launched a Carolyn Breuer Signature model. In 2000 she found her own record label „NotNowMom!-Records“, the first release is her next record „Fate Smiles On Those Who Stay Cool“. The CD sold very well in the Netherlands and the then Minister of The Interior De Vries quoted her name and the album title at a given speech in front of the Dutch parliament. The second release on „NotNowMom!“ „Night Moves“ reached the Top 20 in Japan. The year 2002 saw the release of „Serenade“, an album featuring self-penned tunes that were performed with her quartet plus the famous Dutch Concertgebouw Orchestra Amsterdam. The orchestration was arranged by Henk Meutgeert. This Classical Jazz Crossover record was released on NotNowMom! and BMG/Ariola (with a different cover). In 2003 this CD was awarded with a renowned German prize that is usually granted solely for Classical artists. Since 2004 Carolyn has been working steadily with „Witchcraft“, a force de mayor of female Jazz musicians. The famous L.A. based trumpet player Stacey Rowles was a fixed part of the band until her sudden death in 2010. In 2006 Carolyn was invited to play with the WDR Big Band as a guest soloist that also had five compositions of her own in the program that were arranged by Michael Abene for this production. In 2008 her son was born and Carolyn had to slow down a bit on her Jazz career. Nevertheless she released with German author Sabine Bohlmann two CDs for children, the Jazzical „Der kleine Erdbär“ and the Rap/Hip Hop production „Pauli – Ich rap mir die Welt“, the latter being distinguished with a medal of the German music schools association. She also managed to perform in 2009 the whole record of „Serenade“ at Gärtnerplatztheater with the house orchestra. In the year 2010 she played sideman gigs with various Jazz projects and a third release with Sabine Bohlmann, an add-on CD for the book „BabySpielZeit“, saw the light of day. In 2012 she played with Alan Parsons in his band when he was given the Life Achievement Award at the DIVA show. In 2013 Carolyn was the musical director for a show at the Lit.Cologne with famous German author Roger Willemsen. And, finally, after taking a long break from the Jazz world, her comeback „Four Seasons Of Life“ with orchestra, big band, quartet, piano, acoustic guitars and all sorts of arrangemants hit the world. In September the whole record is performed with 37 musicians on stage at Gasteig Munich. In 2014 Carolyn Breuer initiated a new project called "Shoot The Piano Player!" and recorded "Shoot The Piano Player! Volume One". She as well went on tour with the "United Jazz And Rock Ensemble" under the direction of Wolfgang Dauner.